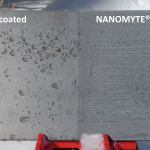 Somerset, New Jersey (USA): NEI Corporation has issued a product update, following the successful introduction of NANOMYTE® TC‐5001 – a nanotechnology-enabled, anti-corrosion coating for zinc‐plated and hot‐dip galvanized (HDG) steel. 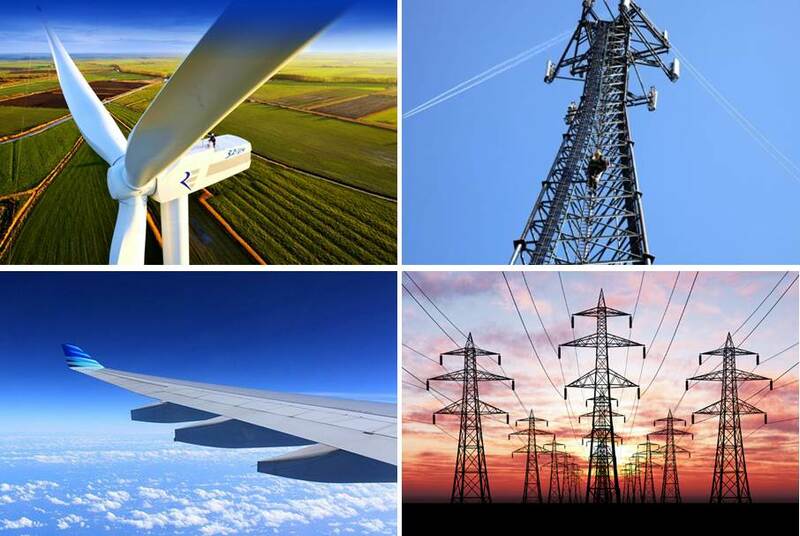 TC-5001 is a nanostructured composite coating consisting of organic and inorganic phases. 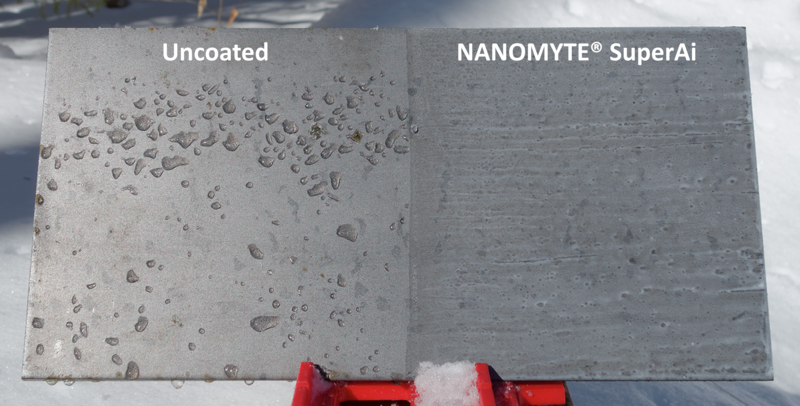 It can be used either as a standalone coating or with the water-based, self-healing pretreatment, NANOMYTE® PT-100. In its current form, TC-5001 can be applied on metallic parts that have a zinc-based finish. Recent developments on its effectiveness and usage are outlined below. 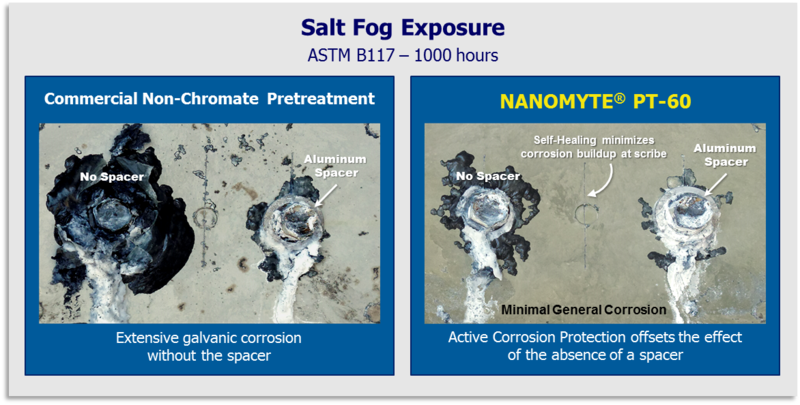 Automotive parts coated in-house were subjected to salt-spray testing (ASTM B117) for over 1,000 hours to test the effects of corrosion; the TC-5001-coated parts showed no signs of white rust. Additionally, parts plated with alloys of zinc and aluminum were also coated with TC-5001 and are currently undergoing field testing. 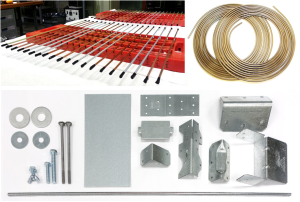 Examples of structural parts that can be coated with TC-5001 (or related products) for corrosion protection are shown on the right. 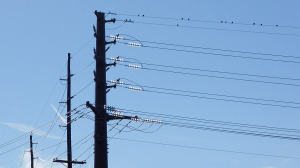 NANOMYTE® TC-5001-coated structures provide significant corrosion protection while supporting power lines in service. 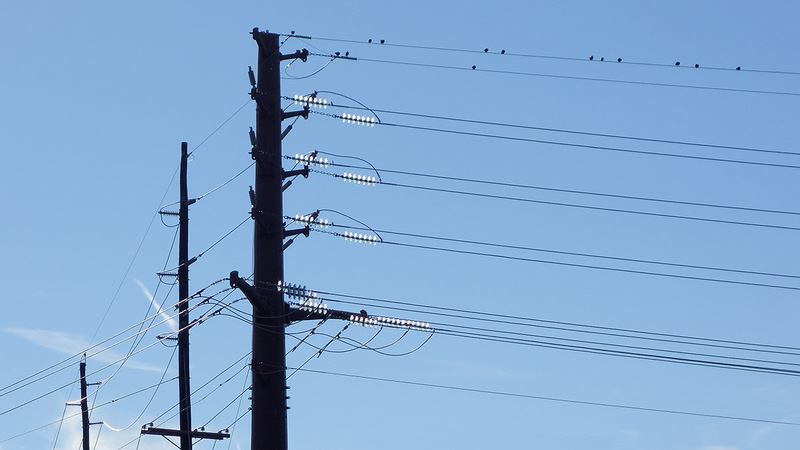 The coating has been successfully demonstrated to protect electrical grid components still in service for several months to date. 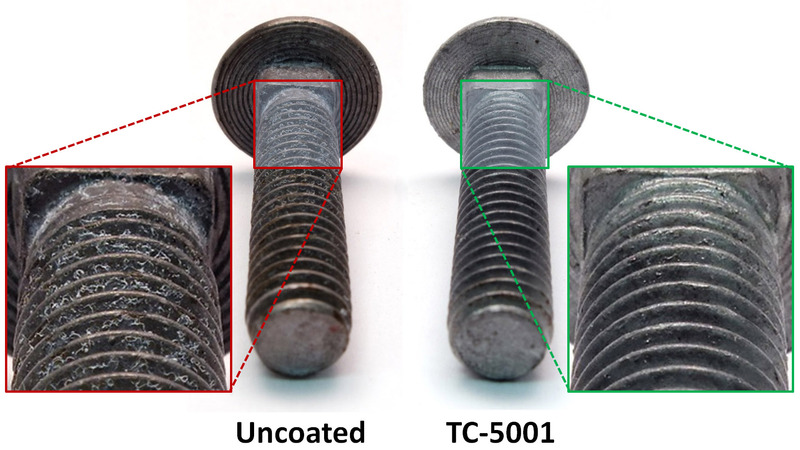 Various TC-5001-coated nuts, bolts, and screws were exposed outside for 5 continuous months and showed no visible signs of corrosion. To the right is a pair of galvanized steel screws after 5 months of outside exposure. 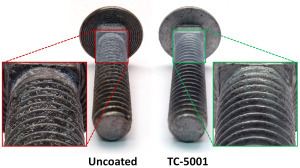 The uncoated screw (left) shows the emergence of white rust on the threads while the coated screw (right) is still protected. Spraying: The coating is applied on clean surfaces using a commercial high volume, low pressure (HVLP) spray gun. Touchup spraying can be carried out to protect small pieces or tight locations using a touch up sprayer. Rolling: Coating is done in a cross-pattern; left to right, then up and down as quickly as possible since the coating dries quickly. Brushing: Brush application is carried out in a cross-pattern; up and down, then left to right. A new development that was requested by metal finishers was to accelerate the curing of TC-5001. For applications requiring faster cure times, the coating can be brought to “dry to the touch” conditions in a matter of 5 to 10 seconds with thermal curing at 150°C to 200°C. This facilitates easy incorporation of the coating in a production line with continuous moving parts on a conveyer. 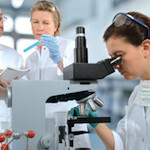 Once the coating is dry to touch (partially cured), subsequent coatings can be applied and cured together. This waterborne pretreatment improves adhesion and minimizes white & red rust formation when used in conjunction with TC-5001. In order to further enhance the degree of protection provided to metal parts, NANOMYTE® SR-500EC has been introduced. It is a transparent coating designed to provide easy-to-clean surfaces. The product is a nanostructured composite consisting of organic and inorganic phases and provides a hard, dense, and smooth coating finish. SR-500EC strongly adheres to metal, glass, and ceramic surfaces, and resists scratching and chipping. Additionally, it has superior water repellency and soil resistance. The hydrophobicity of the coating can be tailored as per application requirements. The coating is a single component product that is easily applied by dip, spray or brush and can be cured at room temperature. 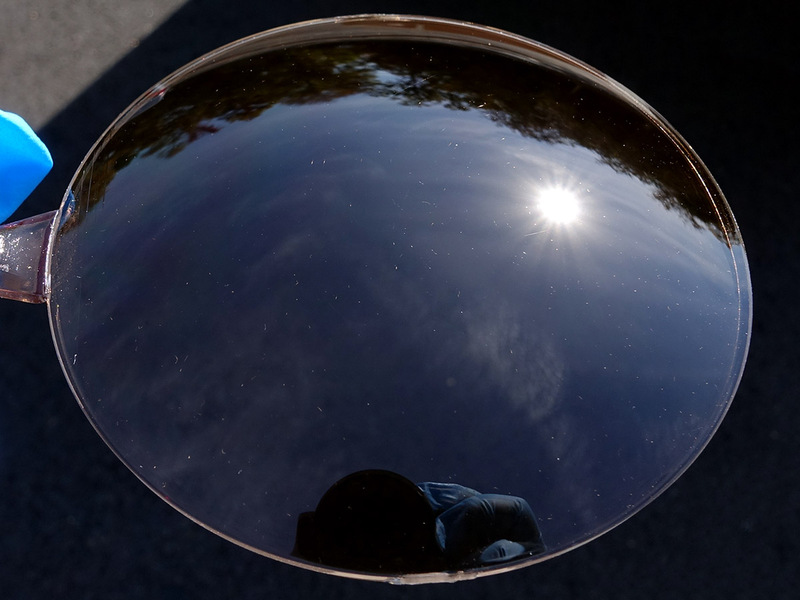 Currently, SR-500EC is undergoing field trials on metal, glass, and polymer surfaces where both anti-corrosion and hydrophobic properties are desired.